A homemade meal is always preferable, since it is made with ingredients that we know and control. If you are in the morning rush put in a grocery bag 5 or 6 kinds of vegetables to get to work. Add in some protein such as a small tin of tuna, a boiled egg or some chicken, beef, or lamb (leftover from the previous day). Take 5 minutes to chop them and you have just prepared a healthy, protein-rich salad. Avoid carbohydrates at lunch (pasta, rice, bread, noodles), as these foods can quickly increase blood glucose levels only to cause later in the afternoon hypoglycaemia which can lead you to the easy solution of sweet. Protein slows the release of sugar from the meal in the blood, thereby helping to maintain relatively stable blood glucose levels and reducing hunger and cravings for sweets. A good breakfast provides energy for the start of our day, but many fail to eat breakfast due to the lack of time. Do not forget that people who do not eat breakfast tend to choose unhealthy snacks for brunch and / or overeating at lunchtime. If you are in a hurry, mash a banana in a blender with a little skim milk and drink the smoothie on the way to the office! If you buy breakfast from the cafeteria, choose a wrapped sandwich or toast with wholemeal bread. Do not underestimate the value of a good night’s sleep. If you need sleep and feel tired at work, you are looking for food as a source of energy, although you may not be actually hungry. If you could stay up late to work, do not wait until the evening to be very hungry to think about what you will eat. When you are hungry, it is very likely to order a high-fat food (eg pizza). Try to organize your meals before dinner: go out for a while in the afternoon, buy what you want to eat at night; put it in the fridge and so you will have your dinner ready when the time comes and you are hungry. If you cannot resist the temptation of the junk and unhealthy food, just do not buy it! How many times did it occur to you to buy a chocolate bar with the plan to eat a little or only on ’emergency’ but you eat the whole bar before midday?. The best way to cut back on sugary foods is not to buy them. Instead, have a healthy snack handy. Take along a piece of fruit (apples are great) or have a few uncooked nuts in your drawer to nibble between meals. When calculating your daily calorie intake, you need to take into account the calories contained in drinks as well. The sweetened soft drinks must be avoided and beware fruit juices may be misleading. If you are thirsty, drink water: Contains no calories and has many health benefits as well! If you’re going to get into a meeting where you know that they offer unhealthy snacks, bring along your own healthy choice: An apple or a handful of nuts will help you avoid temptation. From the time our stomach is full, until the brain perceives a sense of satiety, it takes about 10 minutes. So when you eat quickly, the amount of food you consume is greater, and when the brain perceives saturation, you already feel ‘swell’ and discomfort. 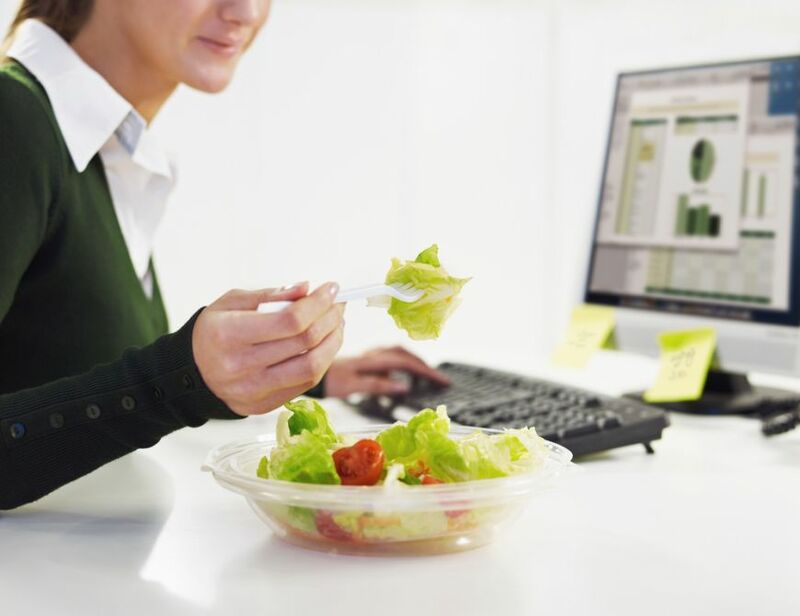 Dedicate yourself 10 minutes of rest time and enjoy your meal focused only on it, even when you’re eating on your desk. Chew each bite thoroughly before swallowing, enjoy the taste, smell and color of food and relax during your little launch break! I find it hard to believe that coffee contains that many calories. Okay. Maybe black coffee for me from now on! Thanks for the great tips!